The Head of the River Race takes place on the Thames on Saturday 31st March allowing riverside visitors to see a flotilla of quality rowing crews. The event this year starts at Chiswick Bridge at 3.45pm and finishes in Putney. 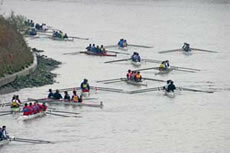 The event is a processional race for eights rowed over the same course at the University Boat Race but in reverse. There are up to 420 crews and involves some 3,750 competitors, believed to be a record number for a single continuous rowing event. The first race was held in 1926 and 21 crews took part and has taken place nearly every year since apart from the war years. The previous year's winning crew starts first, followed at 10-second intervals by the other crews in finishing order, and then by new entries in alphabetical order. The race takes approximately 1.5 hours from the first crew starting to the last crew finishing. The record time for the course is 16mins 37secs set in 1989 by the British National Squad. The Race is usually held on the third or fourth Saturday in March each year, depending on tides and the date of the Boat Race. Usually the two events are held on separate days, although in 1987 and 1994, the Boat Race took place in the morning and the HORR in afternoon. The local RNLI stations will be holding collections on the day.